Wow, now these are awesome comics! Incredible how very detailed they are, especially since you drew them at such a young age. I love the colours and how creative you were, great story. Was really lots of fun to check out, certainly not the last time. Ha! These are great. I get a similar satisfaction out of reading the comics I made as a kid - I'm glad I've kept them around. Good to see you've done the same! Does Dan Jurgens hate Superman? why it gives me the the feeling that u hate leo by seeing those drawings? Wow Andrew your comics are really good and cute, it's really Awesome that you kept them . I second that sentiment! Maybe I should start trying to find some of my old TMNT story comics and post them here too. Granted, however, none of them were even 25% as good as young Andrew's! People kill off their favorite characters all the time in fan fiction. Once there was a young lady in the fandom who loved Michaelangelo, yet she went and wrote this really graphic scene in a story where Mikey got stabbed in the neck. Besides it's just a what-if scenario. 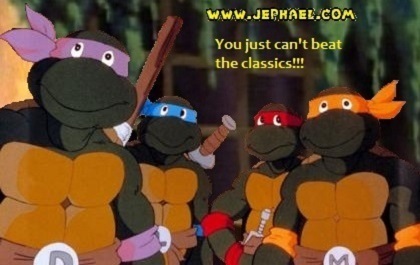 I've seen another where Raphael is hper-violent, even to the other guys and even more than in any official TMNT version. But how did the idea of the TMNT using machine guns come up? Probably Mirage TMNT Vol. 1 #20 and #21. You know. The source material. No, I mean a fan comic. Looking at this again. Maybe I should scan in the rest. It's all rather same-ish, though. Personally, I really love your old stuff, so scan away! I might post some of the old TMNT comic books of my own...if I fix some problems with my scanner. I may not be a fan of the gore and blood aspect of TMNT, but your talent was definitely emerging though here when you were younger. Why didn’t you touch them all up to have red masks? There really isn't any TMNT universe in my mind where they have all red bandannas and Bebop and Rocksteady and all that is running around.